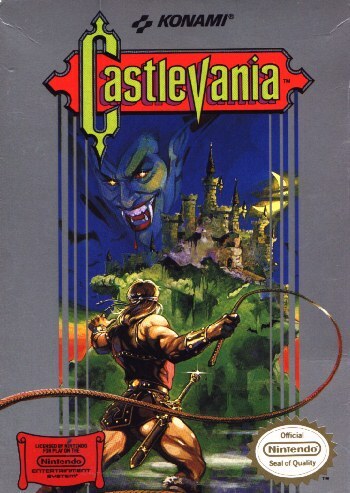 The very first console title in a series of many, Castlevania, released in 1986 by Konami, was a typical platform game in which the player takes the role of Simon Belmont, a descendant of the Belmont clan, a family of vampire hunters. 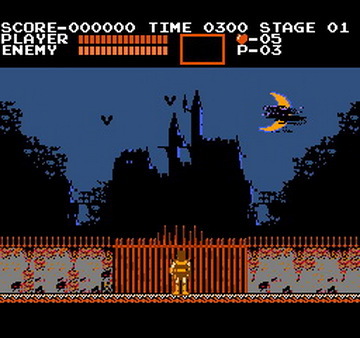 He travels to Dracula's demonic castle in Castlevania to fight his way through the castle destroying the castle and Dracula himself. 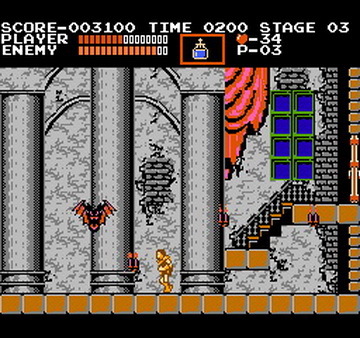 Belmont's main weapon is a whip called "Vampire Killer", while the secondary weapons are powered by Hearts, collected by attacking candles and killing monsters. Secondary weapons available are Daggers, Holy Water, Flying Axe and the Boomerang-esque Flying Cross. Hidden items such as power-ups and food (health replenishment) items are also found by attacking brick blocks within the levels, a feature inspired by Nintendo's Super Mario Brothers with countless hidden items across the game's levels so look around! 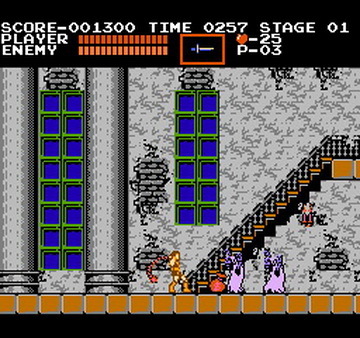 Castlevania is one of those games you're not allowed to dislike lest you be stripped of your title of gamer and thrown to the normies. It is the most classic of classics up there with FF and LoZ. Controls were standard and responsive, though jumping was a bit ridgid. Mechanics for the stairs were horrible and my dislike of them only grew (including in sequels). Graphics were decent, clearly aged. Some monsters were cool looking but most backgrounds were blurry and/or boring. Fortunately, they did not distract from the gameplay which many bad graphics do. Sound was high quality, specifically the music. I really enjoyed the BGM when I heard it, though I felt like it wasn't playing that often. SFX had more depth than other games but of course featured high pitched beepyness at times. Gameplay is the important part of this game and where it shines. The difficulty level and need to study enemy patterns to counter them was really enjoyable. The game seems very short, however, and I was left wanting more. Fortunately, there are plenty of hacks and sequels to play! 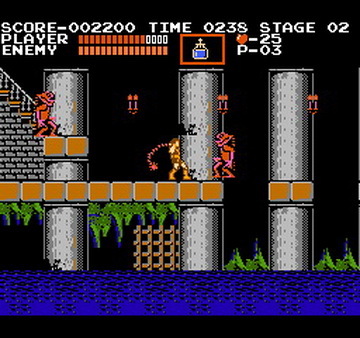 Anyway, it's standard dungeon-crawling platforming without any fluff. Smash the candles, grab the powerups/weapons/special items/hearts, kill enemies, get to boss and kill it, move to next stage. 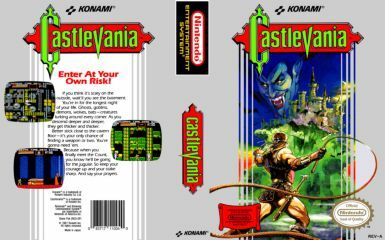 I didn't feel like this title had much in the way of puzzle-solving, secrets, etc but it's a good soft entry into the Castlevania series. Overall, this is a good title to put under your belt and playable for most types of gamers, really. 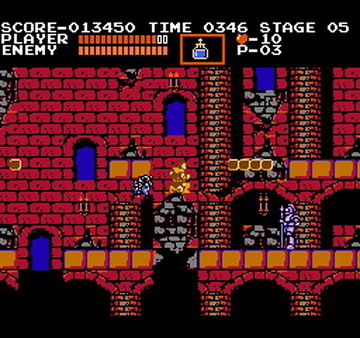 Castlevania is a classic NES game, one of the best and far better than most of its contemporaries. It features some of the best music of any NES game, and some of the best atmosphere, all at a very early stage in NES history. 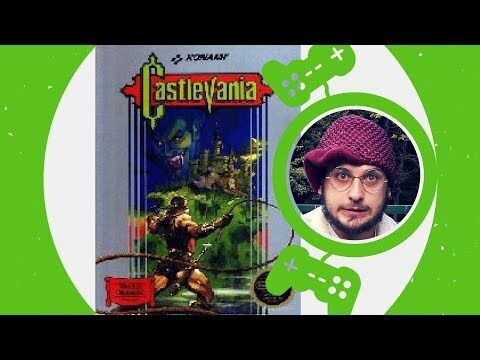 Simon battles enemies out of popular horror novels and movies, using excellent weapons such as a whip, battleaxe, boomerang, and the amazingly effective holy water. It does not, however, feature a password continue or battery. The key to winning this game is knowing the hidden bonuses and tricks. With all the excellent features of this game, its drawbacks are sometimes overlooked. 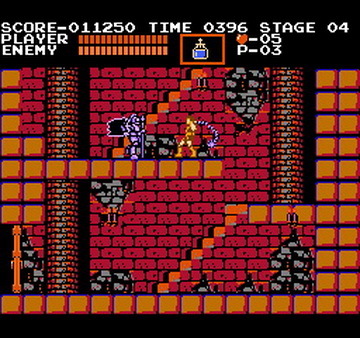 Gameplay is unique, and sometimes players will be frustrated by Simon's inability to do much while on stairs, for instance. He also frequently gets knocked into pits. However, overcoming these drawbacks will lead to a very rewarding gaming experience.